It seem to be universally agreed that Monroe County lost big when they were assigned 6 Senators to each represent a little piece of their small county. Even with huge growth over the past 10 years, they still require less than one Senator (using the County Apportionment system). Monroe County has been very vocal in offering public testimony of how their county has suffered by being so fractured in the Senate. The Holt Proposal improved the situation quite a bit by reducing the number of Senators from 6 to 2. But many still ask if even that is really necessary. The results of my investigation showed that there is an alternative. It becomes clear when you take all the Northeast Counties (Carbon, Bradford, Lackawanna, Luzerne, Monroe, Pike, Sullivan, Susquehanna, Wayne, and Wyoming) and lump them into a Region of 4 Senators. 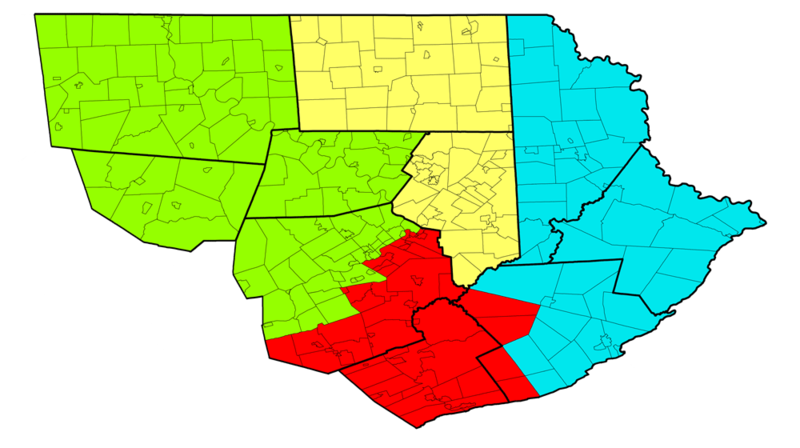 Once we have this perspective, there appeared two possible ways to divide the region using the County Apportionment numbers as a guide. This was the way that first appeared. It split Luzerne and Monroe Counties, but kept the population fairly close to the target (about 3,500 person difference). 3 Senate districts included a county split. There were multiple options for which townships are split from the rest of Monroe. 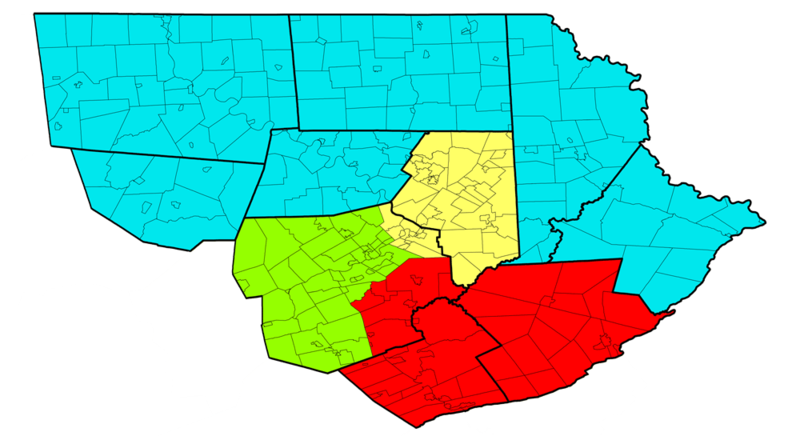 The example here splits off Eldred, Polk, Tobyhanna, and Tunkhannock. This was the alternate way found in my investigation. It splits only Luzerne County, leaving all the smaller surrounding counties whole. The population varies more from the target (about 7,000 person difference) but is still within the 10% range. 2 Senate districts include a county split. Supporters of Version 2 might argue that the added variant is justified because a larger county can support more Senators without the consequences suffered by a smaller county in a similar circumstance. Just ask Monroe if you need the proof. Opponents might say that Version 2 favors the smaller counties too much and that the more equal population in Version 1 sticks closer to the Constitutional law. Either way makes an improvement. Which version do you think is best? See how all this fits in with the big picture by revisiting the PA Senate Overview. Personally, I prefer Version 1. Monroe may be split, but it avoids having an extremely large geographic district like in V2 (and we currently have based on the 2001 redistricting). Also, Sullivan and Bradford are rather different from Monroe and Pike, and would better keep to the “community of interest” aspect of redistricting as well.